Editor’s note: To close out the year, we are counting down the top 14 stories of 2014. VeloNews and Velo magazine’s editorial staff voted this piece as one of our favorite articles of the year. If I had a dollar for every time I’ve been told, “We’re a small company, and the only way we can compete with the big companies is to make a better product,” I’d be a very rich man. Given the engineering budgets of companies like Trek, Specialized, Giant, and Cannondale, it’s hard to make a bike better than they make. But Felt Bicycles is a small company that surpasses them in some areas. Just the fact that you most likely hear very little about Felt, especially now that its bikes are no longer being ridden by UCI WorldTour teams, may indicate that it’s not a marketing-driven company. Rather, it is a product-driven company, and has been ever since Jim Felt started making custom aluminum bikes with his name on them decades ago. Felt employs a small team of talented engineers, and the company and its product line are too small for them to be dedicated to single categories. Instead, ideas that work on road bikes rapidly cross-pollinate to mountain, cyclocross, and track bikes, and vice versa. Some of these ideas can make a big difference. Here are a number of innovative details of Felt bikes that could easily escape notice, yet I believe they are rare enough and important enough to make Felt bikes stand out as superior in these areas. You may think that how a seatpost is clamped to the bike is a yawner. However, with a material like carbon that only works well in tension and not in compression, it’s a significant issue. A seat binder generally works by compressing both the top of the seat tube and the seatpost. But to optimize stiffness of both the frame and the post, both are built with stiff fibers that can’t tolerate being pinched; the fibers will crack if deflected very far over a short distance by the seat binder clamp. Felt’s solution for clamping aero seatposts is unique and game-changing, and its solution for clamping round posts puts reliability above weight and style considerations. Instead of clamping around the post or wedging it from the front or back, Felt clamps each wall of the aero seatpost against each inner wall of the seat tube by means of a vertical slot running down each side of the post. On each side, a bolt extending out of a thickened area at the top edge of the seat tube passes through the seatpost slot and threads into a separate aluminum plate conforming to the inner shape of the seatpost wall. Tightening each bolt simply clamps each wall of the seatpost flat between each aluminum plate and the wall of the seat tube. To illustrate the concept, consider driving over a flat carbon-fiber sheet on a smooth concrete floor versus driving over a carbon seatpost. Obviously, the car tire will not crush the sheet of carbon, because there is no air space to compress it into, but it will crush both a round and an aero carbon seatpost. The benefit to Felt’s clamping system is not just reliable clamping; it is also reduced weight, increased comfort, and increased frame durability. Since it does not have to withstand crushing forces to hold it in place, the seatpost walls can be very thin (you can easily flex the side walls of Felt AR, DA, and IA seatposts with your fingers) and hence lightweight. This also provides a slight amount of vertical compliance to a seatpost shape with which comfort is hard to come by. Finally, it prevents tearing the frame apart by tightening the seatpost, which is what wedge clamps are doing. Clamps that wedge the seatpost from the back are effectively trying to tear the back of the seat tube off (so it has to be overbuilt and heavier to withstand it), and systems that wedge the seatpost from the front are effectively working to tear the top tube away from the seat tube. This may be part of the reason that you sometimes see bikes of pro riders tear apart in a crash at the wedge clamp inside the top tube that pushes against the seatpost; the rider standing out of the saddle is twisting at this area stuffed with carbon in a much less effective layup than throughout the rest of the frame. Beyond a great clamping system, Felt builds a little suspension into its big “Vibration Reducing Aero” seatposts by encasing 3T’s “Difflock Comfort Module” saddle clamp in them. This 3T system fits into the large cross-hole in the top of the post. It surrounds the rail-clamping core with an elastic polymer allowing the cylindrical clamping module to twist and return when the rider hits a bump. The clamp also will accept all of the different available shapes of saddle rails without interchanging clamp parts. Finally, the seatposts are flip-position with different offsets available. Even Felt’s round seatpost-clamping systems are different from the run of the mill. In its carbon F-series road racing, Z-series endurance road, and ZW-series women’s road bikes, Felt doesn’t chop weight by using a thin, single-bolt clamp. Instead, F, Z, and ZW frames all have taller two-bolt aluminum seat binder clamps, despite the battle to get frames below target weights, like the magical sub-700-gram weight. The 700-gram Felt F FRD frame does have a pair of titanium bolts threading into a scandium nut bar in the tall clamp; do does the F1. And rather than using a single slot, Felt has two slots on opposite sides of the seat tube, to reduce the amount that any individual fiber is forced to bend. Carbon frames and forks used to have a woven top layer for aesthetic purposes that provided little additional strength or stiffness, while adding weight. Perhaps you assumed, as I did, that the checkerboard-weave top layer of Felt’s top frames is like this, but it isn’t. Instead, that layer of TeXtreme fabric actually saves weight and adds toughness to Felt frames, but it costs around 10 times as much as the unidirectional fabric it replaces. TeXtreme Spread Tow Fabric offers the strength and toughness of two layers of unidirectional carbon in a single layer of the same weight as one of those unidirectional layers. Unidirectional carbon layers cannot stand alone for the same reason that a bulletproof vest made out of fibers all running the same direction could not stop a bullet; an impact can split the fibers if crossing ones are not there to hold them together. Since the broad packets (“tows”) of TeXtreme fibers cross at 90 degrees, forming the checkerboard pattern, they provide the toughness of two crossing layers of unidirectional fabric with a single layer. Furthermore, the weaving allows thinner fibers to be used in the fabric without it being too delicate for human hands to wrap around a frame shape. For added security, Felt uses a TeXtreme layer on the inside of the frame as well — the first layer workers put down. This can prevent “mystery” carbon frame failures by preventing fibers from imploding inward on impact. If a carbon frame takes an impact, it is often difficult to tell that there has been damage on the surface. But the sharp application of force can break internal fiber layers, which can splay out inside of the frame. Cracks can then propagate from there, and a rider’s frame may suddenly fail while JRA (“just riding along”), but the failure was actually due to a prior crash. Felt’s layer of woven TeXtreme inside can prevent severed unidirectional fabric fibers from splaying into the interior of the frame tube on impact, and can therefore stop the propagation of a crack. TeXtreme fabric is made in Sweden, and due to laws intended to prevent strategic materials from falling into the hands of the Chinese military, Felt had to import it to the United States, have it impregnated with resin certified as being non-weapons-grade, and then send the pre-preg fabric, refrigerated, to China for use in its frames. You can imagine the added costs. Once Felt bought enough of it, TeXtreme went through a certification process with the U.S. government so that it sends the fabric to China directly, and it is pre-pregged there; this cost savings has made it possible for Felt to now use TeXtreme in a second model from the top in each frame series. Carbon bikes are no longer made by laying fabric pieces into mold cavities because the layers can’t overlap properly at the seam, and the molds are too hot from the previous frame to lay pre-preg fabric in without becoming sticky. Instead, workers (in a cool room) drape cold carbon pre-preg fabric pieces around a mandrel shaped like a smaller version of the finished piece. Heat and pressure make the resin flow like water; computers calculate the resin viscosity with temperature to optimize flow through the layers. Mold channels let resin and air escape. For premium frames, the mandrel is often EPS foam (Styrofoam) dipped in latex. Once the clamshell mold closes around it, air is pumped into the latex bladder, applying pressure against the carbon layers. Felt’s top models, by contrast, are done with “inside-out” molding. Rather than molding a solid mandrel out of EPS in a clamshell mold with two female halves, Felt molds two separate “coffee-cup”-like mandrel halves, which, when put together, form a hollow version of the frame made out of a thin and tougher, denser foam. This takes two male-female clamshell mold halves for each clamshell “coffee-cup” mandrel half, or four molds total for just the mandrel. The hollow mandrel halves are taped together, and, rather than dipping the resulting mandrel in latex repeatedly to get the desired thickness, it is coated with silicone. Jeff Soucek, Felt’s director of R&D, said the silicone layer is smoother and more uniform than multiple layers of latex, which can form drips and be uneven in thickness and surface finish, and it has higher a heat resistance. Soucek said the precision of the shape of this mandrel means the layup moves very little during molding, so he can reduce the frame weight by minimizing overlap of layers. He said with an EPS foam mandrel, overlap must be around 5mm, whereas 1mm overlap is possible with the clamshell mandrel. Air is pumped into a nylon bladder inside of the clamshell mandrel, which is uniform and tough and can’t blow out with temperature or due to uneven thickness the way Soucek said a latex bladder can, causing a section of the frame to not be compacted properly. On Felt’s second-tier frames, which are done with a solid EPS-foam mandrel, it is encased in a nylon bladder rather than a latex one. Many of today’s carbon frames are “net-molded;” nothing is machined or bonded in afterward to make the bearings in the bottom bracket or headset fit. Thing is, there is no shortage of riders complaining about their carbon bikes creaking, caused by movement of the bearings or bearing cups in the frame. As a bike mechanic, especially if you are installing internal electric wires for electronic shifting, it may be beautiful to look inside the bottom bracket shell of a top end carbon frame and see that it is completely hollow; you can look right up inside the seat tube, down tube and chainstays. It’s obviously very light, and it’s easy to route cables and wires through. However, you can imagine that the bottom bracket bearings of, say, a press-in BB30 bottom bracket may be more free to move around relative to each other if there is nothing but a big hollow space between them. By contrast, even on the 700-gram F FRD frame, Felt molds a separate carbon cross-tube — a bottom bracket shell — and then bonds and molds it into the frame. This keeps the bearings lined up with each other so they don’t creak and to extend their life. Of course, you don’t have such easy access to the big hollow tubes to stuff the rat’s nest of internal electronic wires and junction box into them. Again, veering from the “ideal” of a net-molded frame, Felt does not depend on molded carbon seats to hold the headset bearings. Rather, it bonds in thin aluminum bearing seats to ensure precision of the bearing function. No, Felt does not have its own wind tunnel. However, it has a legacy in aerodynamics that started with Jim Felt, while he worked at Easton, making custom aero frames for triathletes out of special aero Easton aluminum tubes. Furthermore, Felt does not restrain itself from making no-holds-barred aero bikes that the UCI does not allow. While other manufacturers tend to sell their UCI-approved time trial bike as a triathlon bike and make some changes in components to speed it up a bit, Felt just went ahead and made the fastest bike it could, with some parts of the frame being over twice the 3-to-1 aspect ratio mandated by the UCI. Felt claims its IA frame has net lift in crosswinds (negative drag, so an aerodynamic propulsive force rather than a drag force) and that the AR road bike and DA time trial bike also have an exceptionally “high yaw profile,” meaning they can go to high yaw (sidewind) angles before the bike “stalls” (the point where the drag force suddenly increases dramatically). Felt claims its “soft airfoil” shape on many of its aero-bike frame tubes performs better in crosswinds by improving reattachment of air after passing the tube, has a higher frame stiffness, and interacts better with a water bottle than sharper or truncated airfoil shapes. It’s also lighter than a sharp airfoil because added material is required to form the sharp edge, as carbon cannot make a sharp bend like that. The company says other shapes have a place; it uses sharp airfoils for the trailing edges of handlebars and truncated airfoils (Kammtails) on vertical tubes that don’t have a wheel or any other parts behind them. Judging by our test of the Felt AR3 against other aero road bikes in the wind tunnel (August 2014 issue of Velo) Felt’s tube shapes work, as the AR3 was the clear winner in any kind of crosswind. Felt claims its UCI-legal time trial bike, the DA, is the fastest UCI-legal bike straight out of the box (i.e., with no changes in component spec). However, it claims that its UCI-illegal IA triathlon bike is faster yet: 4.5 minutes faster over an Ironman than the DA — a full 100 watts of power savings over a road bike! 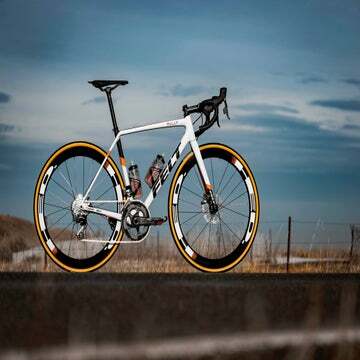 Felt’s road product manager Dave Koesel recommends that triathletes NOT buy bikes with the UCI-approved sticker, saying, “that thing is a parachute” (in order to get the UCI certification, a manufacturer must make the bike slower than it otherwise could). There are other items to mention as well – things that Felt has quietly been doing for some time that now others are trumpeting loudly about doing. Hollow dropouts are one example — where the chainstay and seatstay form a continuous hollow loop past the dropout area, and only the last small bit where the wheel clamps is compression-molded. This allows Felt to make the F1 PR frame — the frame Thor Hushovd and Magnus Bäckstedt used at Paris-Roubaix — that has become more relevant due to the surge in popularity of racing road bikes on gravel. By bonding custom aluminum dropouts into the hollow chainstay/seatstay loop (in place of compression-molded carbon ones) of the top-end F1 road frame, raising its brake bridge, and lengthening its fork (with bonded-in compression-molded carbon dropouts), Felt has lengthened the rear end and wheelbase and kicked the seat and head angles back by 1.2 degrees. This allows it to easily accept 28mm (and even bigger tires) and increases the bottom bracket drop (so that the bottom bracket is lower with a 25mm tire and about the same with 28mm or 30mm tires as the F1). This amounts to a super light, confident-handling bike for cobbles and gravel roads. The hollow dropouts forming a loop can also be used as a leaf spring; this feature is incorporated into the Edict 4-inch-travel cross-country race 29er. The Edict is a single-pivot bike that behaves like a linkage bike because of this flex at the dropouts. When you remove the Edict’s shock, the shock-actuation lever snaps down (you have to pull up on it to fit the shock back in) because the spring formed by the hollow stays at the dropout springs open. This means the bike springs to its sagged position, even without the rider on it, so the frame is doing more of the work and the shock less, similar to the anti-squat built into a linkage frame. Another example of something Felt has been quietly doing for a long time that is now being touted by major brands is size-specific tube diameters and layups. Just like it did to Jim Felt when he was making custom aluminum frames, Felt always made carbon tubes smaller in diameter and with different wall thickness for small bikes than for big ones. The only area where this doesn’t hold true is for specific aerodynamic shapes for aero frames, but the wall thicknesses are still thinner on the smaller frames. Felt has invested heavily in its product — in its engineers and the designs, tools, and materials they come up with — and not much in marketing. So consumers just may be surprised at how light, fast, snappy, and tough a bike they’ve barely heard of can be. Editor’s Note: Felt covered airfare for Zinn’s recent trip to its facility in California.